We can effortlessly spend thousands of dollars a year on skin care: cleansers, toners and moisturizers to wrinkle creams, concealers, day creams, night creams, and eye creams. All of this time and money is wasted if we do not look after our skin from the inside. Occupying some 20 square feet, the skin is the largest organ in the body. Like any other organ, it needs the right nutrients to function correctly. Unlike the other organs of the body, we also expect our skin to look great. To find out what we need to put into our skin to make it look beautiful on the outside, we went to the people who have the most at stake when it comes to beauty, inside and out – supermodels. Let’s see what they have to say about the best nutrients for beautiful skin. Miranda Kerr won’t let a day go by without taking at least four teaspoons of coconut oil, on a salad, in her cooking or in green tea. Jessica Gomes, fresh fruit & vegetables, fish in the diet for omega-3 and fish oil supplement. Karlie Kloss – protein shakes with chocolate protein powder, almond milk and banana or blackberries. Supermodel Carolyn Murphy’s beauty secret? Drinking lots of water and then moisturizing. The Institute of Medicine recommends 12 eight-ounce glasses of water each day. Sleep – according to supermodels Hilary Rhoda and Tao Okamoto, getting enough sleep is the most important thing. Hilary aims for seven hours a night, while Tao, who would sleep for eight or nine hours if she could, settles for six or seven. Advice from Elle.com is to make up a batch of Green smoothie with spirulina, flax oil, kale, frozen fruit and maca powder. Contains fiber, anti-oxidants and nutrients that stimulate the digestive system. Sip throughout the day and drink plenty of water! Now, dig a little deeper and find out what nutrients are contained within these dietary secrets. Pretend you are designing an all singing, all dancing supplement that contains everything you need for perfect skin. What nutrients would you insist on putting into it? What are the best vitamins for your skin? Vitamin A – Exposed as they are to the elements, the cells of the skin are in a constant state of renewal. As old or damaged cells slough off, new cells are being manufactured in the deepest layer of your epidermis. Vitamin A accelerates cell renewal and acts as a potent weapon in the fight against acne1. Vitamin D – Dietary vitamin D intake has been associated with a reduced risk of melanoma2. Vitamin E – Actually a group of molecules with similar structures, vitamin E offers protection against damage from ultraviolet radiation, inflammation and wound healing (Source: Linus Pauling Institute Micronutrient Information Center). See also PON1 below for more information about why vitamin E is one of the best vitamins for healthy skin. Vitamin K – Vitamin K is used after surgery to help skin healing and reduce swelling and bruising (Source: WebMd). Some of the best nutrients for healthy skin aren’t vitamins at all, but minerals and other nutrients such as antioxidants (which mop up those dreadful free radicals that you produce with every breath you take), as well as proteins, flavonoids, oils and herbal extracts. Selenium – This trace mineral protects the skin from free radical damage and may also offer protection against cancer. Brazil nuts are an excellent source of selenium; you need only consume four of these each day to get all the selenium you need. Other good sources include seafoods; specifically, salmon, tuna, crab, sardines, halibut, snapper, cod, oysters and shrimp. Lamb, light turkey meat, cooked beef and whole wheat pasta. Copper – Copper boosts collagen production. Collagen is a very important protein which gives structure to your skin. If you are deficient in copper and your collagen production declines, your skin will eventually begin to sag. Chamomile Extract – Chamomile is a herbal tea that is bursting with skin-boosting nutrients: apigenin, luteolin, and quercetin are all flavonoids. These, together with the volatile oils, alpha-bisabolol and matricin, contribute to chamomile’s antioxidant, antispasmodic and anti-inflammatory properties, calming, soothing and healing the skin. Coenzyme Q10 – This is a powerful antioxidant that the body is capable of synthesizing, although production decreases with increasing age. CoQ10 also participates in energy metabolism and in basic cell function. Good dietary sources of CoQ10 include liver and other organ meats, whole grains and fish (such as tuna and salmon). Collagen – Hydrolysed collagen is massively popular and effective for strong and healthy hair, nails and skin. Evening Primrose Oil – An oral preparation of evening primrose oil capsules (3 x 500 mg twice daily for 12 weeks) improved skin moisture, elasticity, firmness and fatigue resistance in a randomized, controlled trial (International Journal of Cosmetic Science). Hyaluronic Acid – Hyaluronic acid is used medically for the treatment of burns and chronic skin ulcers4. Keratin – Keratin is actually a family of proteins and a key component of skin, hair and nails. Keratin has been proven to boost skin moisture and elasticity, reduce wrinkles, as well as improve skin compactness and overall skin appearance. You can stimulate keratin production by eating foods rich in B-vitamins (such as bananas), zinc (oysters), and vitamin C (oranges). Paraoxinase 1 (PON1) and vitamin E are antioxidants that are both produced in the body. In 2012, scientists in Egypt reported the results of a study in which they examined tissue and venous blood levels of PON1 and vitamin E in 15 healthy volunteers and in 45 individuals suffering from either psoriasis, vitiligo or alopecia6. All of the patients in each group showed significantly lower levels of both PON1 and vitamin E in both serum and in tissue samples compared to the healthy volunteers. This is the first time that anyone has reported a study that examined the roles of these two Vitiligo and psoriasis are both antioxidants in these three conditions, which are believed to be autoimmune in origin. While vitamin E is readily available in supplement form and in the diet, PON1 is not yet being commercially produced. However, it has been shown that a combination of cranberry extract (2 g/day), vitamin C & zinc (300 mg/day) can significantly increase the activity of PON1 in non-smokers7. Smokers are out of luck because nicotine reduces the activity of PON18. So quit smoking and start taking cranberry extract, vitamin C and zinc if you don’t want diseased skin. 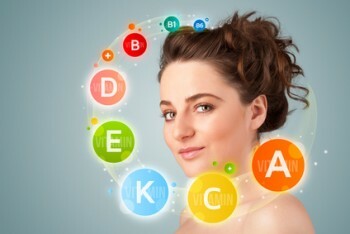 Now that you have identified the important nutrients for healthy skin, what is your next step? You need to nourish your skin both on the outside and on the inside. Taking a high-quality multivitamin can help you get all the necessary vitamins and minerals you need for a beautiful skin. This can help you nourish your skin from within. In order to nourish your skin from the outside, we recommend using an all-natural skin care line that doesn’t contain parabens and sulfates. 1D’Ambrosio DN, et al, “Vitamin A Metabolism: An Update.” Nutrients. 2011. 2Berwick M and Erdei EO, “Vitamin D and melanoma incidence and mortality.” Pigment Cell Melanoma Research. 3Newkam K, et al, “Supplementation of flaxseed oil diminishes skin sensitivity and improves skin barrier function and condition.” Skin Pharmacology and Physiology. 2011. 4Iannitti T, “Corticosteroid transdermal delivery to target swelling, edema and inflammation following facial rejuvenation procedures.” Drug Design, Development and Therapy. 2013. 5Beer C, et al, “A randomized, double-blind, placebo-controlled clinical trial to investigate the effect of Cynatine® HNS on skin characteristics.” International Journal of Cosmetic Science. 2013. 6Ramadan S, et al, “The Antioxidant Role of Paraoxonase 1 and Vitamin E in Three Autoimmune Diseases” Skin Pharmacology and Physiology. 2013. 7Begcevic I, et al, Can cranberry extract and vitamin C + Zn supplements affect the in vivo activity of paraoxonase 1, antioxidant potential, and lipid status?” Clinical Laboratory. 2013. 8Gupta N, et al, “Effect of Resveratrol and Nicotine on PON1 Gene Expression: In Vitro Study.” Indian Journal of Clinical Biochemistry. 2013.